For a while I have been occasionally trying out UPNP media servers so I can play videos from my Linux server directly on my television. This is to avoid the WDTV Live that annoyingly doesn’t allow you to skip/jump forward/backward. I haven’t actually tried that many, but today I think I have found one I like: PS3 Media Server. This is a UPNP media server written in Java, originally for the PS3, but since then extended to work as a generic UPNP media server. It works quite well with my television, crucially allowing me to skip forward and backward through the video. I can even hold down the button to skip at larger increments. Yay! But that was the good news. As with everything there is a downside. While the player worked fine streaming .avi files, at first I couldn’t play an .mkv as it wanted to transcode it before streaming it over the network. At first I thought I had surpassed that issue by installing the mencoder package, until I discovered that the act of transcoding the video messed up the ability to skip forward or backward. It would skip, but it would take over a minute to resume playback. Not good. Because I knew the television could play .mkv files from USB storage, on a hunch I renamed one of them to .avi to see if that would trick PS3 Media Server into not transcoding and if the television would play it. Success. Six years ago we moved offices from the middle of Clayton campus to out on Blackburn Road. It took them six months, but eventually they renovated around us enough for most of us to move into a new open plan area towards the back of the building. For a few years now I have had a Google Alert setup to notify me of mentions of my own name as well as links to my site. I haven’t received that many alterts, but most of the time I can immediately recognise it as a blog/twitter/flickr/etc post that I have recently made. Other times it is related to another Stephen Edmonds (there are a few around). Today I got an alert referencing an article by ZDNet Australia titled Govt plans keep RailCorp CIO post empty. 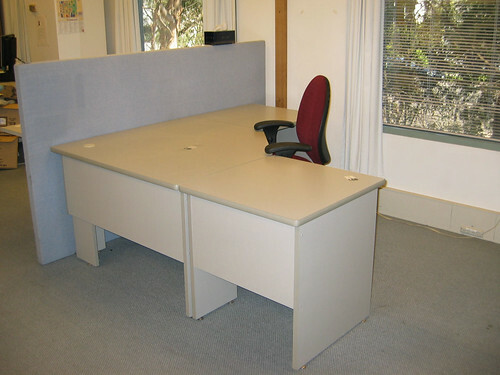 I followed the link, to see my i mage of an empty desk. Now, if that were the quality of desk that RailCorp is giving its CIO, then it is no wonder that it is still empty. Yes, yes, I know that my image is just being used to illustrate a point. Now, I wish they were using a better image – not what a camera club judge would refer to as a ‘record shot’ – but this brought a smile to my face as I think it is the first time that an image of mine has been used AND correctly attributed.